Another week, another manager. I’d hardly had time to learn which way the accent went on Garcia’s first name when he was gone to be replaced by Billy McKinlay. The circumstances of his departure were rather sad so I can only wish him a happy and healthy future. I must admit that a Scottish Head Coach was not what I expected from the Pozzos. This feels like another era. Billy’s first line-up was eagerly anticipated and, having styled him as a no-nonsense Scot, Fabbrini’s was not a name I expected to appear. 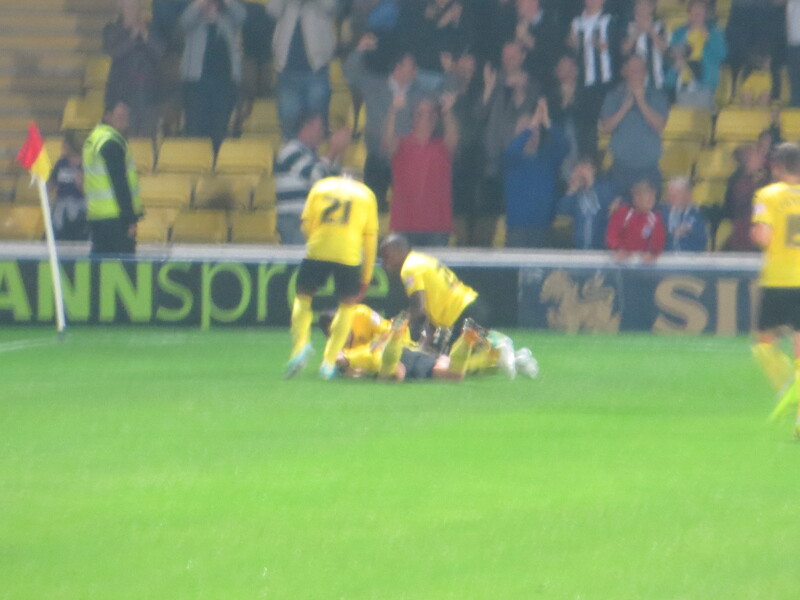 But he was in for Murray with Dyer and Ekstrand replacing Anya and the injured Angella. So the starting line-up was Gomes, Pudil, Cathcart, Ekstrand, Paredes, Munari, Tözsér, Dyer, Vydra, Fabbrini and Ighalo in a 4-2-3-1 formation. Okayyyy! Toumani Diagouraga (affectionately known as Dave) started for the visitors and Mark Warburton, ex-Academy coach, was in the opposition dugout. It was a lively start for the home side with Fabbrini skipping over a couple of tackles and playing a one-two with Vydra before being closed down. The Italian had also earned warm applause from the crowd for tracking back early doors. Vydra did well to retain the ball following a challenge and get a cross in but Douglas got between Munari and the ball so Button was able to gather safely. Vydra exchanged passes with Dyer before evading a tackle and hitting a shot that was deflected into the side netting. 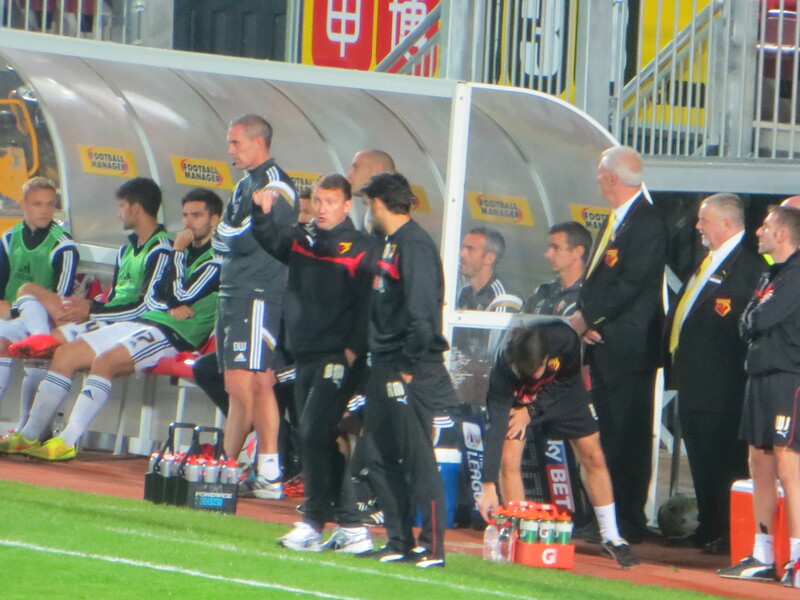 From the corner, Munari headed the ball on to Ighalo whose shot was also deflected wide. Another corner was cleared to Paredes who played it back in to Tözsér whose cross-shot was saved. Then Dyer found Ighalo who saw yet another shot deflected wide. After a quick counterattack, former Watford youngster, Diagouraga, had Brentford’s first goal attempt of the game but his shot was wide of the target. Watford should have made the breakthrough as Dyer played a short corner to Tözsér who returned the pass for Dyer to cross towards Ighalo whose header rebounded off the crossbar. Paredes controlled the ball on the right then nutmegged a defender, a move that deserved a better outcome than his cross flying into an empty box. Pudil was booked for running into McCormack. It looked a harsh yellow, especially as the Brentford players were going down very easily as a tactic to disrupt our play. Off the field, Harry Hornet was hoovering just in front of the Lower GT stand. I kid you not. Our habit of falling asleep at set pieces continued as Judge lofted a free-kick to the far post where Douglas connected but Gomes saved comfortably. Vydra and Paredes exchanged passes, the Ecuadorian hit a cross, but Button claimed the ball. Jota broke and unleashed a shot which Gomes had to stretch to tip over. Then Judge tried his luck with a shot from distance that flew well wide of the far post. Vydra played a great ball to Ighalo in the box, but it was on his wrong foot so he took a couple of touches and was then knocked over by Tarkowski. It looked a bit soft and the referee paused but eventually pointed to the spot. To the surprise of everyone in the Rookery, Ighalo stepped up to take the penalty himself, hitting it straight down the middle where it was saved by Button but Ighalo was alert and knocked the follow-up over the keeper much to the relief of the Watford faithful. As the players returned to the centre circle for the restart, Tarkowski and others expressed their displeasure at what they must have perceived to be a dive, which was a bit rich given their collective inability to stay on their feet when any Watford player was in the vicinity. The referee came to calm the situation and showed both Ighalo and Tarkowski the yellow card. In time added on at the end of the first half, Gray slashed a shot well wide of the target. His blushes were spared by the offside flag. So we reached half time happy to be a goal to the good, if a bit disappointed that the complete dominance of the first twenty minutes had not yielded more. 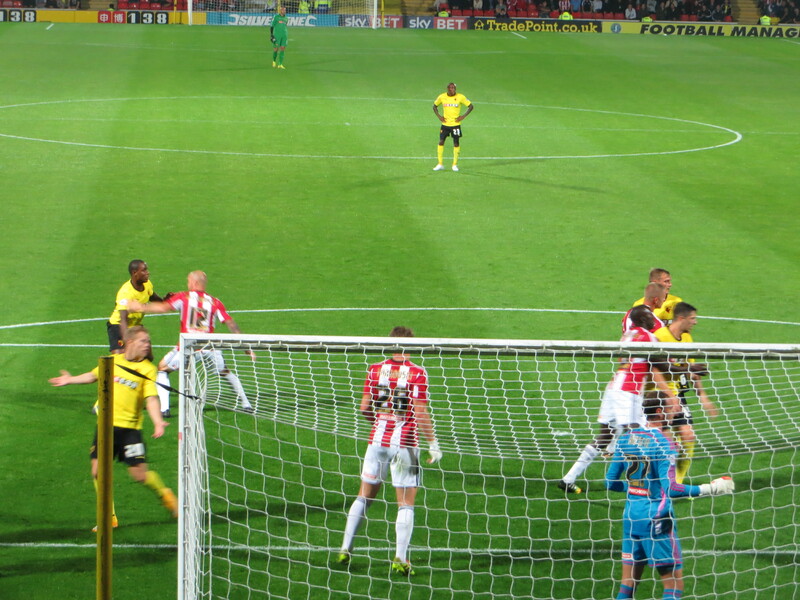 Brentford had the first chance of the second half as a cross from Bidwell flashed across the Watford goal but Gray couldn’t connect and it was he, rather than the ball, that ended up in the net. Vydra found Fabbrini who hesitated before playing the ball so lost out to Judge who he then fouled and so found himself in the referee’s book. Jota got himself into a great position, but hit his shot into the ground and it bounced wide of the far post. Then Gray beat the defence, but his shot was straight at Gomes. The visitors were level on 57 minutes as Judge played the ball out to Douglas who slotted it past Gomes. It was too easy and very disappointing, but no more than Brentford deserved for their dominance in this period. McKinlay made a change immediately, replacing Fabbrini with Anya. Gray broke forward again, but his cross went begging. Then Judge tried another shot which flashed wide. The first 20 minutes of the second half had been all Brentford so it was encouraging to see Vydra break forward, he found Anya who advanced, but Bidwell intervened and the ball went out for a corner. 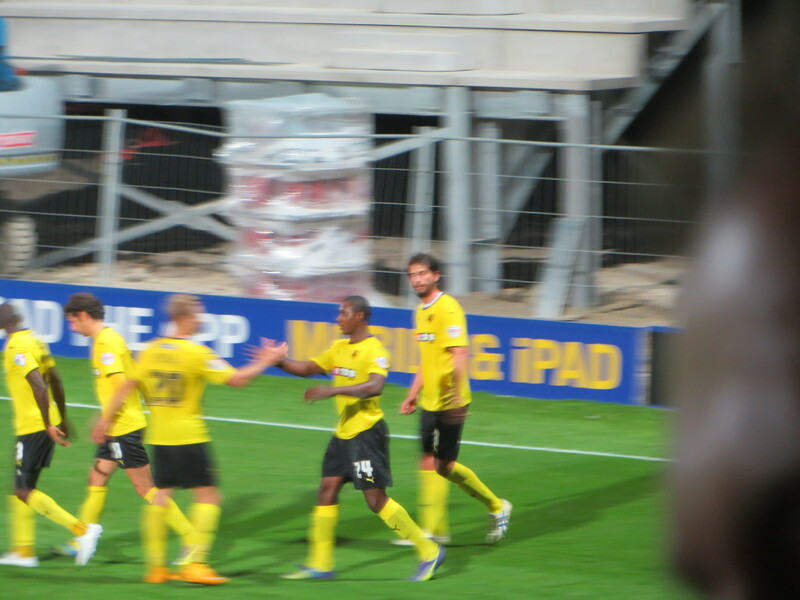 On 70 minutes, Watford took the lead again with another beauty from Vydra. The ball was bouncing in and around the Brentford box when it came out to the Czech who hit a pile-driver past Button into the net. It was one of those rare occasions when I am glad that the goal was at the opposite end of the pitch as I fear I would have ducked if I’d seen that ball flying at me with power that looked fit to burst the net. The home side brightened up at this point and could have increased the lead further as a poor clearance reached Anya who crossed for Ighalo, his shot was blocked and rolled to Vydra whose first touch was poor so he just helped the ball on to Button. Brentford tried to strike back as Odubajo broke into the box but he shot over the bar. With a quarter of an hour remaining, Abdi replaced Ighalo. Gomes threw the ball out to Dyer who ran the length of the pitch, but his cross was behind Anya. Brentford made another substitution as Diagouraga made way for Proschwitz. Abdi played a through ball aimed for Vydra but it was a little too heavy and rolled through to Button. Anya played a one-two with Vydra before his shot was deflected wide. After more great work from Vydra, Dyer found Anya but his cross was straight at the keeper. The fourth official indicated four minutes of added time with the Rookery roaring their team on. Early in the added period, Paredes was booked for time wasting as he strolled over to take a throw-in. Then Gray beat Pudil on the wing and was dragged down by the Czech who accepted his second yellow and was applauded off by the Rookery for taking one for the team. Vydra then made way for Hoban, to shore up the defence, while Pritchard waited to take the set piece. The free kick was met with a header from Bidwell that was just pushed over by Gomes. The Brentford keeper, Button, had come up for the free-kick so could then be seen dribbling the ball around our box before he had to belt back upfield as Anya was breaking and crossed for Dyer whose shot from distance was blocked. Brentford cleared but Anya picked the ball up and advanced again, this time crossing for Munari who couldn’t control his header which went across the goal. The final whistle went to cheers from the home fans who had been thoroughly entertained. I’m not sure that we learned too much from that game, given the injuries, but the highlight for me was seeing Vydra back doing what he does well, scoring cracking goals, but also getting involved making chances for others. That bodes very well for the rest of the season. This entry was posted in Watford FC and tagged Alan Judge, Alan McCormack, Alex Pritchard, Almen Abdi, Andre Gray, Billy McKinlay, Brentford FC, Craig Cathcart, Daniel Pudil, Daniel Tozser, David Button, Diego Fabbrini, Gianni Munari, Heurelho Gomes, Ikechi Anya, Jake Bidwell, James Tarkowski, Joel Ekstrand, Jonathon Douglas, Juan Carlos Paredes, LLoyd Dyer, Mark Warburton, Matej Vydra, Moses Odubajo, Nick Proschwitz, Odion Ighalo, Oscar Garcia, Ramallo Jota, Tommie Hoban, Tony Craig, Toumani Diagouraga, Watford FC on October 2, 2014 by franelynn.